Heartwood » Blog Archive » What’s your reaction to this wood? What’s your reaction to this wood? 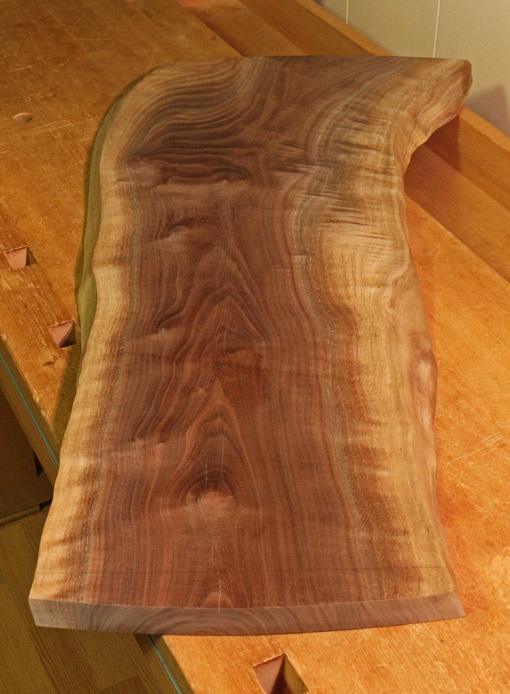 Take a look at the end grain of this live-edge board. Without causing undue stress and tension, do you notice anything? You probably notice that the board is from a tree with an off-center pith. The wider growth rings on the far right side, compared with the corresponding years on the left side, represent tension wood. When a tree trunk leans due to environmental stresses such as gravity, snow, or light availability, it wants to redirect its growth upward and thus bows. To accomplish this, it forms aberrant wood known as reaction wood on one side of the tree, often recognized by its wider growth rings with the pith located off center. In softwoods, the reaction wood, called compression wood, is usually on the underside of the bow, while in hardwoods it known as tension wood and is usually found on the upper side of the bow. The growth ring width asymmetry and consequent decentration of the pith can be dramatic in softwoods, but mild to absent in hardwoods. Reaction wood differs from normal wood in cellulose content and structure. There are visual and behavioral clues to the presence of reaction wood. It may be difficult to recognize in roughsawn boards at the lumberyard. Look for growth ring asymmetry in flatsawn boards. This is easy to notice in a live edge board but possibly not in a board with sawn edges. An unexplained lengthwise split or a pronounced crook (a curve in the width plane of the board) may be caused by the abnormally high longitudinal shrinkage of reaction wood. After the wood is in your shop, take note of behavioral clues such as persistent and unexplained distortion after milling. Another possible clue that most woodworkers have encountered is a stubbornly persistent fuzzy surface on an area of wood despite repeated attempts at smoothing it – you sand it and the fuzz never goes away. More confusing may be an unexpected excessively blotchy look that shows up after finish is applied. This wood does not want to play nice; avoid it. I have read, however, of wooden bow makers taking advantage of the abnormally greater strength of tension wood. There are exceptions, of course. This is wood – every tree, every board is an exception! Being very cautious, I’ve monitored this walnut board with suspicion for a long time now, through partial milling and changes in moisture content. There are only some old shallow surface checks and a little distortion that has settled. I think it is safe to use in a project. It pays to watch the wood. Perhaps the lesson is to be judicious in your use of such wood. Would it make a good frame element in a cabinet, or a good table top? Probably not. However, it would make a good standalone floating wall shelf. Yea, I agree in general, but I’ve kept an eye on this particular board long enough to trust it for a small table top with a very sturdy base. ive never dealt with this type of wood before… if you were to rip it, would it then become unstable again since you’re removing internal stresses from one side? So for your table top, will you leave it basically intact across the grain? Yes. Ripping a board with significant reaction wood can release internal stress and cause it to immediately bow, just as you suggest. This can be dangerous on a table saw. For the design of the piece, I will not be ripping this board. Even though it does seem pretty tame in one piece, if I were going to rip it, I would use the bandsaw.